Style is one thing, but you can never have style until you are totally comfortable with whom you are. Our clothes have that magic thing; they let you be you. How is that possible? This is a secret, but we'll let you know: it's about fit and tailoring. The better a garment suits you, the better it fits, the better it falls over your shoulders, the better it feels on your back and the more comfortable you become. That's why Oscar Jacobson is very meticulous about details, fitting and tailoring the old way (with stitches rather than glue). When you feel what you are wearing, it seldom feels good. But when you don't think about it, when you can walk, sit and move without having "something in the way", that's when you can relax. That's when you can... "not give a damn". And that's how it feels wearing Oscar Jacobson - your invisible friend that lets you be you. 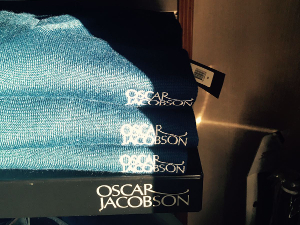 The essence of Oscar Jacobson Man is "the Italian art of tailoring interwoven with British textile heritage, expressed in a pure and simple Scandinavian spirit". Sounds pretty impressive, right? You can also call it the love of textile, tailoring, simplicity and respect for the male body! 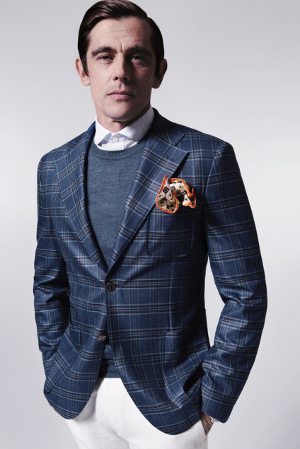 Oscar Jacobson dresses the modern man, regardless of body shape. We have three different fittings and 35 different sizes, and if you want we can create a so-called "single-piece" production. That's the closest you can get to a real tailor, sitting in his atelier with tailoring pins in his mouth and a measuring tape around his neck. How come we got involved in golf? How come we ended up as a very well known and respected golf brand? Well, style has always been an important part of golf. It's almost part of the game. So when we started with golf clothes our feeling for style, tailoring, simplicity and materials became very sought after. Not to mention the fact that our clothes made you play better. They made you think you played better, anyway. That's because they had a better fit and didn't restrict your movements. Today we are working very hard on finding new and better materials that work for golf players around the world. Our latest breakthrough is our three-layer-system, which protects you from the wind, cold and sun, but also lets your body breathe. 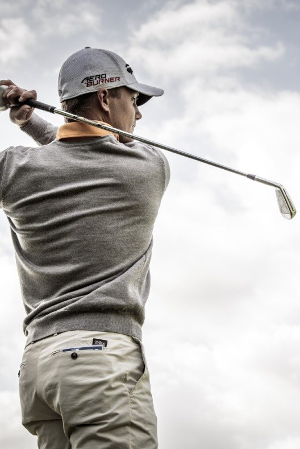 And yes, your swing will improve. 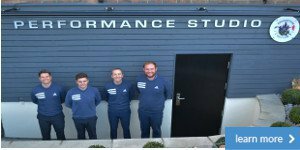 We have built a fantastic working relationship with our friends at OJ and it's a brand we are extremely proud to stock. 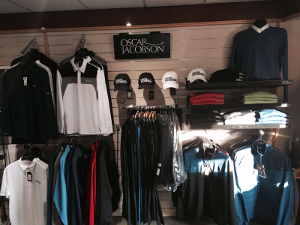 We feel that Oscar Jacobson offers a great mix of style, heritage, fashion and comfort at a great price which makes it a perfect fit for our shop. 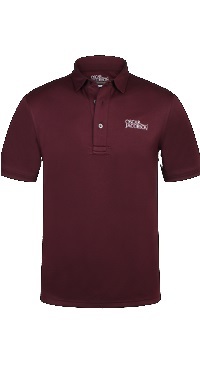 The Collin Tour Polo Shirt - 145gm interlock functional poloshirt with sewn collar and print on left sleeve and neck. Tour version with embroidered logo on chest. Simple, but effective and an excellent cut- available in 6 different colours and sizes running from S-XXL (Long sleeve available) - £45. Bradley Tour ¼ Zip Fleece - 260gms jersey double knit t-neck sweater with contrast pipings in collar. Embroidery on left sleeve and neck, Tour version with embroidered logo on chest. 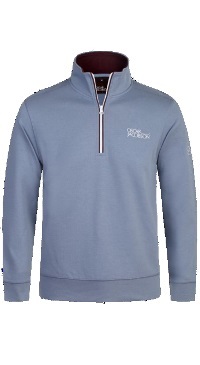 Our best selling fleece! Great for on and off the course throughout the year. Available in a multitude of colours and sizes running S-XXL - £65. 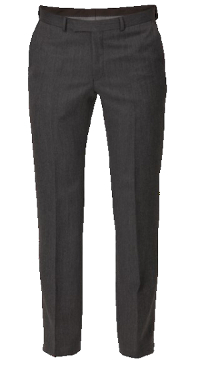 Dave Tour Trouser - Dave trouser is available in a normal or slim fit and a lighter or heavier wool blend for summer and winter. The quality is a wool blend from Italy. Foot width 40cm in size 50. A fantastic buy at only £65. 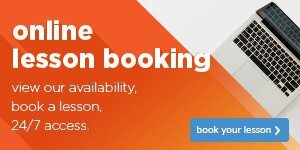 Click here to reserve an item today.